This morning at approximately 8:23 AM, the FDNY’s Marine 6 responded to a report of a sinking barge at Coney Island’s Steeplechase Pier. 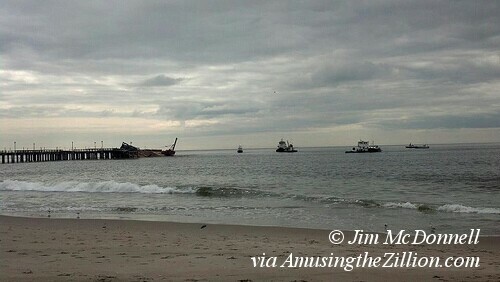 NYC Fire Wire reported “All hands going to work for a sinking Barge with occupants trapped. Marine 9 rescued 2 at this time.” The barge has a crane with a 500 gallon fuel tank on it and the end of the pier was said to be in danger of collapse. Photographer Jim McDonnell was on the beach and captured the scene in these photos. 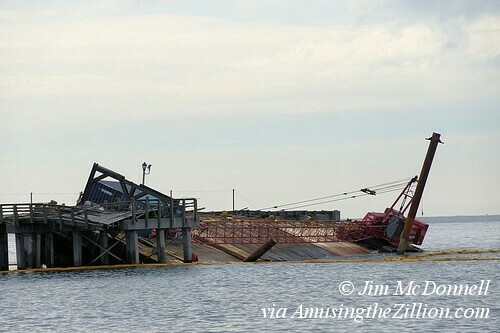 Containment booms were put in place to protect against an oil spill. When more information and photos are available, we’ll post an update. Bruce Handy photographed the barge and crane last night and said it was already tilting. The equipment had been at the end of the pier for the past few days for repairs of the Sandy-damaged pier. “The main diagonal beam that was raising the floor has been removed. Looks like they are stripping everything and will redo all the wood,” he said. I saw the barge yesterday afternoon and it didnt look right, one side was lower in the water then the other. but I just figured, what do I know.